Nubar, your duochromes make my world a prettier place. Nubar Wildlife is beautifully named as it twinkles between an earthy brown and foresty green depending on which way the light catches it. The formula builds nicely after the first coat and the above photo shows that two coats were needed for an opaque finish, really impressive stuff. I did get a teeny chip on my thumbnail after a day, which is unusual for me – but when a polish is as pretty as this one, you can forgive it nearly anything. 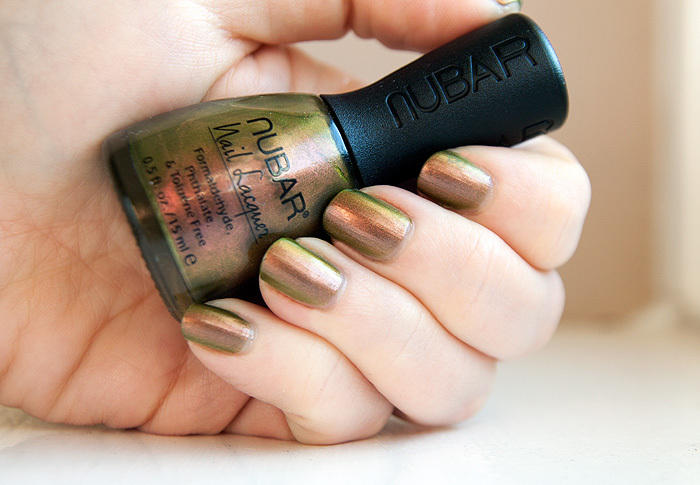 You can keep your Models Own Beetle(notveryjuicy)Juice polishes, these Nubars are still where it’s at. This sounds super nice…so you don’t use any base coat or top coat when you use this?? I do have TK Maxx, but it’s make up shelves are so dirty, they make Superdrug bargain bins look pristine :p I saw some W7 and Leightn Denny there but it looked awful! Charlotte's Corner for Jo Malone at Selfridges.